Wishful Thinking: 16: Russian or Romanian? 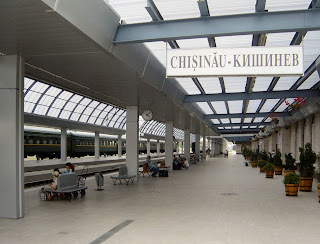 The train station in the capital with the Russian and Romanian spelling of it's name. One of the hardest parts about living in Moldova is not being able to communicate with everyone in my native language. To make matters worse Moldova is mostly a bilingual country where the majority of the populace speaks Romanian as their native language and Russian as the other national language. For those who speak Romanian at home Russian is not considered a foreign language or even their second language it is just their 'other' language. Having said there are still many battles being fought on a day to day basis on the use of the two languages in the public sphere. 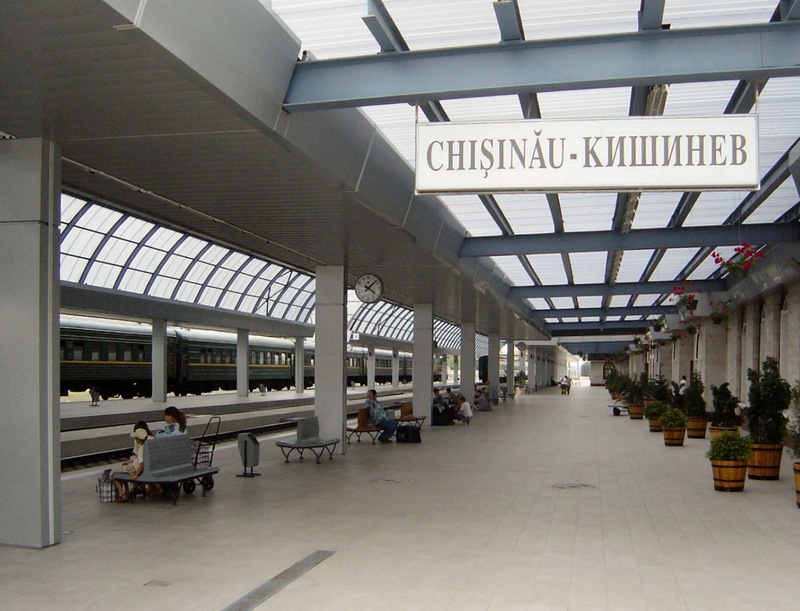 Many ethnic Moldovans see Russian as the language of the Soviet Union that they were forced to learn and while knowing Russian is a valuable asset to them and something they might use often they still believe that Romanian should be the operating language of the government and schools and that all Moldovan citizens should learn and be able to speak Romanian. On the other end is the ethnic Russians or Ukrainians (and sometimes Moldovans) who speak Russian at home and feel like they should have the same rights as others within the country to speak the language they grew up with, and feel like they are being treated the same way Moldovans were treated in the Soviet Union by being required to learn a language that they don't want to learn. The fight over language can be as simple as someone refusing to speak Russian back to someone and instead only speaking Romanian, or vice versa. In my particular situation speaking Romanian I have been in many situations where people couldn't understand why I would learn Romanian instead of Russian since it is the more beautiful and more respectable language as they say, and conversely when a Moldovan learns that I only learned Romanian and I don't know Russian they are usually amazed and delighted, and of course they also tell me that it is the more beautiful and more respectable language. The inverse is also true for the volunteers who learned Russian. Speaking of that, going out with other volunteers can be quite a circus when some people speak only Romanian or only Russian so unless we are lucky enough to find a Moldovan who speaks English it can be quite confusing for them to take our order at a restaurant for instance, or heading to the market together. In particular I went out with one friend who is a Russian speaker and as we stood in front of a stall overlooking some shoes I asked the woman a question and then my friend asked a question in Russian...after which we played a fun game of telephone where the woman would ask me a question in Russian and I would stare blankly trying to understand until I realize it was Russian then my friend would translate it for me and I would reply in Romanian. At which point the woman caught on that I didn't understand Russian and started to speak to us in Romanian and then I had to translate what she was saying to my friend, which confused the woman until we explained. After all the confusion from living in a mixed language country I can imagine it is going to be pretty boring coming home to just boring old English.